Can you believe it’s ScrapMuch?! reveal time again?! Where have the last 2 weeks gone? I feel like June is just flying by, and I hope that summer slows down and doesn’t go anywhere near as fast as June has. Speaking of summer, I’m so happy that summer officially arrives tomorrow! We’ve had such a long, cold, hard winter that the arrival of summer is extra sweet this year. 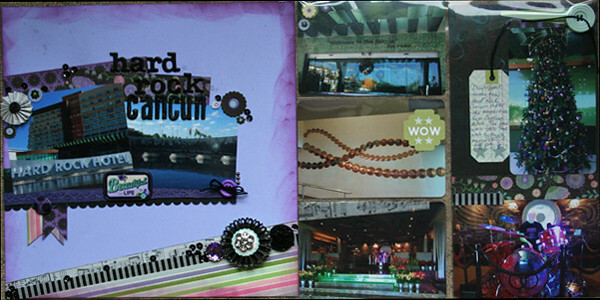 Inspired by summer and sunshine I decided to scrapbook some pictures from a trip to Mexico for this week’s sketch. 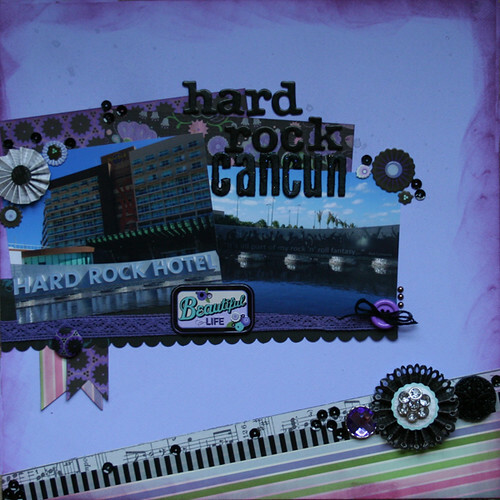 I went with a lot of purples because it’s a common decor colour throughout the resort at Hard Rock Cancun. I went a little wispy with the distress ink because it reminds me of the wispy clouds. The music washi tape is absolutely perfect for a resort focused on music. And it really is a beautiful life. I’m very blessed I’ve been able to take so many incredible vacations. I only visited Hard Rock Cancun for a day shortly after it rebranded and I admittedly took TONS of pictures as the resort is FILLED with music memorabilia. In keeping with my new love for pocket page scrapbooking I added a second pocket page of some of the pictures I took that day. I just pulled some of the patterned paper and embellishments from the left side to add some cohesion to the right, and on the back of the right I’ll add more pictures and journaling and ephemera (aka “stuff”). The Christmas tree there was done up in music themed ornaments. That fancy decor on the wall is all cymbals. And the drums on display there are John Bonham’s from Led Zeppelin. I would love for you to pop over to the ScrapMuch?! blog and see what the rest of the team has created this week, and then play along with any of the sketches this month. Be sure to share your creations with us in the link-up tool for a chance to win an awesome prize! Here is a run down of our Sketch-y Friday rules. Just link up your creations in our sidebar to be entered into a random draw for our monthly prize. You have until Sunday, June 29th, at midnight to participate in any of June’s sketch challenges, each linkup tool will remain open until that date! Thanks for popping by! I will be cropping with the awesome ScrapMuch?! ladies tomorrow! Have a fantastic weekend! Fabulous layout Tiiu, I love your colour combination….makes me want to create something with it. Thanks for the inspiration! Lucky you to have a vacation like that! Awesome layout! Great take on the sketch! Way to go! Tiiu I love this layout and all your embellies (especially the rosette in black) – I too am a Hard Rock fan!! So gorgeous, love the colours and the extra pocket page! Great take on the sketch!! Love how you used the second page to fit more pics!